You can run a NinjaScript strategy in real-time in a live or simulation account within a NinjaTrader chart. 1.Select either the Strategies menu from within the right click menu, or the Strategies icon from the chart tool bar, or press the default CTRL + S Hot Key to access the Strategies window. 2.Select a strategy in the "Available" section, then click the add button. Alternatively, you can double-click any strategy listed in the "Available" section. 3.Once the strategy is added to the "Configured" section, set any strategy properties to your desired settings. 4.Press the OK button to run the strategy. Note: You must set the "Enabled" property to True to turn on the strategy. When this property is disabled, the strategy will be applied to the chart, but will be inactive. 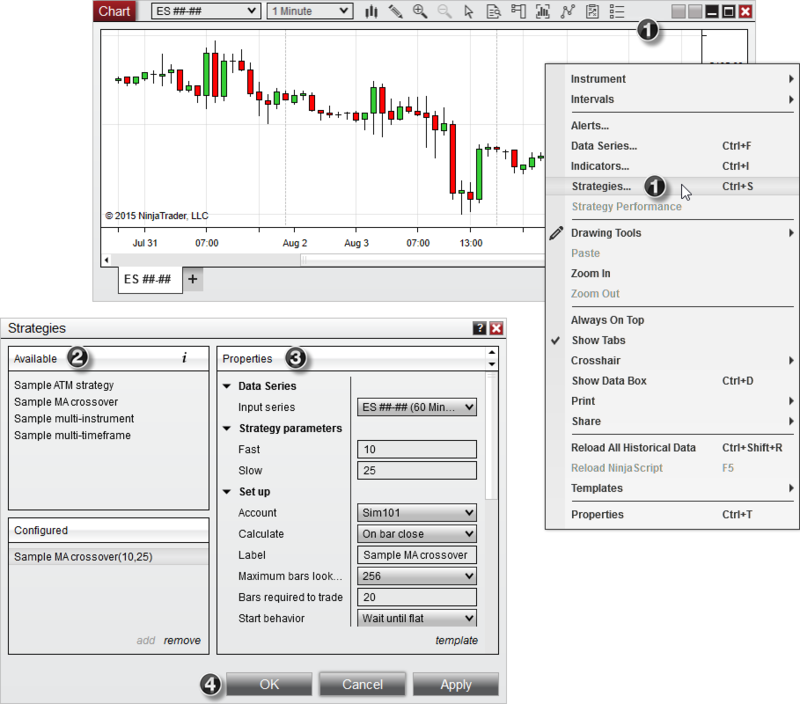 •NinjaTrader must be connected to a live brokerage or market data vendor for a strategy to run. You can also use the Replay or Simulated Data Feed connections. •A NinjaScript strategy is a self contained automated trading system, and orders generated are live. Canceling strategy-generated orders manually can cause your strategy to stop executing as expected. If you wish to manually cancel an order, terminate the strategy itself. To terminate a strategy, first select a running strategy in the "Configured" section of the Strategies window, then click the Remove button. This will completely remove the strategy from the chart and the Control Center's Strategies tab. Alternatively, you can set the "Enabled" property to False to simply disable the strategy, allowing you to re-enable it at a later point without the need to reset it's properties. Sets the Calculation Mode for the strategy. Possible values are "On Each Tick," "On Price Change," or "On Bar Close"
Sets the starting behavior of the strategy, based upon the account position. See the Syncing Account Positions page for more information. Sets the way that simulated historical orders will be processed by the strategy. See the Understanding Historical Fill Processing page for more information. Sets the manner in which entry orders are handled. If set to "AllEntries", the strategy will process all entry orders until the maximum allowable entries set by the "Entries per direction" property have been reached while in an open position. If set to "UniqueEntries", the strategy will process entry orders until the maximum allowable entries set by the "Entries per direction" property per each uniquely named entry have been reached.